Maoists extended the deadline till April 7 for the release of BJD MLA Jhina Hikaka while Odisha government today named the 27 prisoners to be freed for him and Italian Paulo Bosusco being held hostage by two separate groups of the rebels. 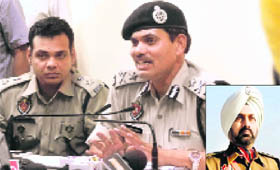 With the arrest of three persons, the city police claims to have cracked the murder case of Balraj Singh Gill, DSP, Moga, and Monica Kapila. The two were found dead in a farmhouse in the Golf Link area near Hambran road on February 1. A facility that allowed Indian students to work here for two years after their courses are over will be closed from tomorrow as part of the Cameron government's drive to cut migration, which may put-off those aspiring to study in the UK. Congress Central leaders today began the difficult task of sorting out the mess in the Punjab unit with a three-member team led by Defence Minister AK Antony talking to a section of state party leaders. 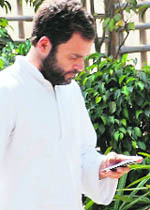 Rahul Gandhi today began a review of the Congress�s performance in Uttar Pradesh following its dismal performance in the Assembly elections. The stock-taking exercise took place in what is termed as the party war room. HARYANA: Harappan relics excavated in Karnal? CHANDIGARH: Aroma accused to walk? Had it not been for a petition filed in the Supreme Court way back in 1995 by Paramjit Kaur of Amritsar, whose husband had gone missing, the truth of killings and mass cremations of thousands of young men in Punjab would have never come to light. Less than six months after the Punjab and Haryana High Court dismissed its own Judge Justice Nirmal Yadav�s petition against the prosecution sanction order, she has moved the Supreme Court. A debt of Rs 15 lakh to repay, an uncertain future staring her in the face and a dream that disintegrates with every opportunity lost for want of money � that�s all Sunita�s life has been since the euphoria around her feat of scaling Mount Everest died down.